The overall objective of BIOCOM is to evaluate the relationships between community attributes and ecosystem processes in dryland ecosystems under different global change scenarios. Technically, drylands are defined as regions that have an index of aridity (ratio of mean annual precipitation to mean annual potential evapotranspiration) of 0.05 to 0.65. These ecosystems are a key terrestrial biome, covering 41% of Earth’s land surface and supporting over 38% of the total global population of 6.5 billion, and are highly vulnerable to global change and desertification, two of the most important and pressing environmental and socio-economical issues currently faced by mankind. 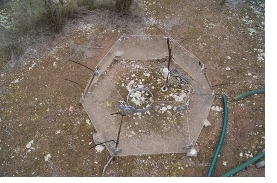 The sensitivity of drylands to these problems derives from the fact that their primary productivity is strongly limited by precipitation and soil nutrient availability, and both of these factors are undergoing changes associated with increasing atmospheric greenhouse gases and air pollutants from combustion of fossil fuels and agricultural practices. Because of the extent of dryland ecosystems globally, and the dependence of an important part of the human population on them for goods and services, it is crucial to understand how they may be affected by global change and, more specifically, to know how the attributes of biotic communities inhabiting them will modulate ecosystem responses to it. to evaluate the relative importance of community attributes as drivers of ecosystem functioning using multiple communities (vascular plants, microorganisms and biological soil crusts) and a combination of manipulative field, natural and common garden experiments. to assess how multiple global change drivers (temperature, nutrient availability and precipitation) will affect key ecosystem processes. to test whether global change drivers modify observed community attributes-ecosystem functioning relationships, and whether these attributes modulate or ameliorate responses to global change. to develop models to forecast global change effects on ecosystem functioning in drylands. to set up protocols for the establishment of mitigation actions based on the results obtained.